Poltergeist is a 2015 American supernatural horror film directed by Gil Kenan and written by David Lindsay-Abaire. A remake of the 1982 film of the same name and the fourth installment overall in the Poltergeist franchise, the film stars Sam Rockwell, Rosemarie DeWitt, Jared Harris and Jane Adams. Produced by Sam Raimi and Robert Tapert's Ghost House Pictures, Real World Pictures and Roy Lee's Vertigo Entertainment, the film was released on May 22, 2015 by 20th Century Fox and Metro-Goldwyn-Mayer in the United States. The film received mixed-to-negative reviews from critics and grossed over $95 million worldwide against a budget of $35 million. On April 10, 2019, it was announced that Russo Brothers would helm a new remake of the franchise. Eric and Amy Bowen are a married couple looking to buy a house for themselves and their three children: 16-year-old daughter Kendra, 9-year-old son Griffin, and 6-year-old daughter Madison. Eric was recently laid off, but they are shown a house that has recently come on the market that fits their price range, so they purchase it and move in. The first night, they hear strange noises in the walls and Griffin finds a box containing clown dolls that were left at the house. In the middle of the night, lights and electronic devices start turning on and off, as some unseen force appears to move through the home. The commotion wakes Griffin, and he goes downstairs and finds Maddie talking to an unknown presence inside the television. She tells Griffin someone is coming, and he attempts to unplug the TV, causing the lights to go out of control. Maddie then tells the family: "They're here" while touching their TV screen. The following evening, Eric and Amy go to dinner with their friends, leaving the three children at home. They learn that their house was built on an old cemetery, although the property developer was supposed to have relocated the human remains. At the house, Kendra wakes up to a strange sound outside. Kendra goes outside and steps in mud, causing her to slide down a slippery hole. She claws at the ground to keep herself from slipping further down. Kendra screams for help when a corpse's hand emerges and begins pulling at her foot, but she manages to pull herself up. Meanwhile, Griffin notices the clown dolls seem to be moving by themselves. One clown doll attacks him, but he destroys it and runs from his bedroom. He finds Maddie in her room, scared, crouching in a corner, and tells her to stay while he goes to find Kendra. Maddie is then lured into her closet and becomes lost in an unending void. As she sees her bedroom drifting away further, she is dragged into the darkness by ghosts. Griffin is grabbed through a window by the branches of the old tree outside their house, which pulls him outside. Amy and Eric arrive home to see Griffin being tossed around in the tree branches, which releases its grip when they come close, while Kendra tells them she can't find Maddie. The family hears Maddie's voice emanating from the television. Amy places her hand on the television screen while Maddie's static hand is seen to be touching Amy's hand from the other side of the screen. Amy and Griffin visit the Paranormal Research department for help. The staff set up equipment in the house and install GPS devices on everyone in the house. While trying to contact Maddie, Eric is ambushed in the closet by a ghost resembling her. Angered, he breaks down the closet wall, throwing a chair into the darkness inside the closet; the chair falls back into the living room of the house, revealing a possible portal Maddie can escape through. The investigators realize that the haunting is a poltergeist. The lead investigator, Dr. Brooke Powell, decides to call occult specialist and television personality Carrigan Burke (revealed, much later, to be Powell's ex). Carrigan explains that Maddie is a possible psychic, able to communicate with spirits. He reveals that the ghosts are trapped and are angry because only the headstones were moved to the new cemetery, but the bodies remain; they plan on using Maddie "to free them from their purgatory". Carrigan comes up with a plan to get Maddie back. He anchors a rope in Maddie's room and tosses it into the vortex. They attempt to use Griffin's toy drone to guide Maddie out, but it is immediately destroyed by the ghosts when inside the portal. Griffin, guilt-ridden over leaving Maddie alone in the first place, goes through the portal himself. When he finds Maddie, the ghosts attempt to destroy the rope to trap them, but Griffin and Maddie grab onto the rope and are brought back through the portal. The family get in their car and begin to leave the house, but the ghosts drag them back into the house and attempt to abduct Maddie again. The family saves her from being sucked into the portal, and Carrigan decides that as the only other psychic, he must go into the vortex and lead the spirits into the light. The Bowens flee as the house is destroyed by the spirits soaring into the sky as a beacon of light. The investigative team run to their equipment, looking for a sign that Carrigan managed to get back. As the Bowens look for a new house, the realtor shows them a house with lots of closet space and an old tree in the backyard; the Bowens drive away laughing. During the end credits, it's revealed that Carrigan survived the incident and is back filming his ghost program, now hosting the show with Dr. Powell. In early September 2013, the crew shot interior scenes for the film in an old residence in Toronto. Exterior shots were filmed on the West Mountain of Hamilton. Principal photography began on September 23 and ended on December 13, 2013. The film was shot and released in 3D. On August 6, 2014, the film's release date was shifted from February 13, 2015 to July 24, 2015. On March 4, 2015, the date was shifted again to when it was previously set for Spy. It was released in 3D. The film's first trailer was released on February 5, 2015. Forrest Wickman of Slate Magazine's opinion was that the trailer made the film appear to be too similar to the original film. James Hibberd of Entertainment Weekly said that the trailer "retains and amplifies several elements from the original", and praised that "the modernizing doesn’t result in, say, the family’s daughter being kidnapped by ghosts in Snapchat". Brad Miska of Bloody Disgusting stated that "while every fiber of my being wants to reject it, [the film] actually looks pretty insane", and praised the trailer's final shot. Ben Kuchera of Polygon also opined that the trailer appeared to be similar to the original film, but that it "looks great, as a horror movie". Poltergeist was released on DVD Blu-ray Disc and Blu-ray 3D on September 29, 2015. The Blu-ray editions included an extended cut of the film. On Rotten Tomatoes, the film has a rating of 32% based on 113 reviews and an average rating of 4.8/10. The site's consensus reads: "Paying competent homage without adding anything of real value to the original Poltergeist, this remake proves just as ephemeral (but half as haunting) as its titular spirit." On Metacritic, the film has a score of 47 out of 100 based on 27 critics, indicating "mixed or average reviews". Audiences polled by CinemaScore gave the film an average grade of "C+" on an A+ to F scale. Writing for Variety, Andrew Barker called it "generally entertaining yet fundamentally unnecessary" and concluded: "Even when one is inclined to admire the cleverness with which the remake revisits and reincorporates Poltergeist's themes, it’s hard to pinpoint a single moment where it improves on them, and the aura of inessentiality hangs thick over the proceedings". Neil Genzlinger gave the film a mostly positive review in The New York Times, writing: "The new Poltergeist might well be the scariest movie 13-or-unders have yet seen, just as the original was for their parents back in 1982. Those parents might find it an enjoyable trip down memory lane, even if they do now recognize it as largely a well-served collection of horror-movie tropes". Eddie Goldberger echoed that sentiment in The New York Daily News, writing "It doesn't approach the original--really, how could it? 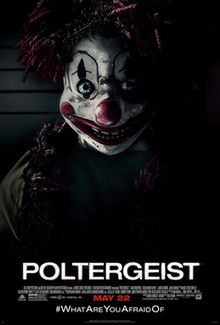 But the new Poltergeist is a fun, worthy horror entry." Tirdad Derakhshani wrote in The Philadelphia Inquirer: "It's not exactly a scary film, but it does provide an enjoyable ride. It's good fun. But it left me befuddled", adding: "Why would anyone want to remake Poltergeist in the first place?". Writing in The Daily Telegraph, Mike McCahill called the film "an efficient scare-machine". Bilge Ebiri wrote in New York magazine: "This new Poltergeist isn't anything special... But it's not a travesty, and that feels like cause for brief celebration". Other critics took a more skeptical view of the film. Writing a review for The Village Voice, Alan Scherstuhl stated, "Poltergeist 2015 is to Poltergeist '82 what today's shipped-frozen-to-the-store Pizza Hut dough is to the kneaded-on-site pies the chain's stoned cooks tossed in the Reagan era. It's the same kind of thing, with the same shape and some shared ingredients, but the texture's gone limp, and there's no sense of occasion about it, and there's some unpalatable goop stuffed in the crust. In a pinch, it beats pizzalessness — but just barely." Linda Cook wrote in The Quad City Times, "The Poltergeist remake is OK, but won't stay with you." Randy Cordova in The Arizona Republic wrote, "Ultimately, the whole affair is forgettable." Poltergeist grossed $47.4 million in North America and $48.2 million in other territories for a worldwide total of $95.6 million against a budget of an estimated $35 million. In North America, Poltergeist made $1.4 million during its Thursday night showings from 2,500 theaters, and an estimated $9.4 million on its opening day. Through its first three-day opening, it grossed $22.6 million from 3,240 theaters, debuting at fourth place at the box office behind Tomorrowland, Pitch Perfect 2 and Mad Max: Fury Road. In comparison to prior horror film reboots, its opening is well below the openings of 2009's Friday the 13th ($40.57 million), 2010's A Nightmare on Elm Street ($32.9 million), 2003's The Texas Chainsaw Massacre ($28.1 million, and right below 2005's The Amityville Horror ($23.5 million). Outside North America, it earned $8.3 million on its opening weekend from 3,750 screens in 36 countries, finishing at sixth place at the international box office. In the UK, Ireland and Malta it opened in third place with $2.2 million and Brazil with $2 million. ^ Dave McNary. "'Tomorrowland' vs. 'Poltergeist' at Thursday Box Office - Variety". Variety. ^ a b "Poltergeist (2015)". Box Office Mojo. Retrieved November 10, 2015. ^ "Poltergeist Remake Shooting Now, First Set Details". horror-movies.ca. September 8, 2013. Retrieved September 15, 2013. ^ Rockingham, Graham (September 7, 2013). "Remake of horror movie being shot on Hamilton's west Mountain". The Hamilton Spectator. Retrieved September 25, 2013. ^ Miska, Brad (February 4, 2015). "Possessed Clown Highlights 'Poltergeist' Sneak!". Bloody Disgusting. Retrieved February 5, 2015. ^ "Fox Shifts 'Poltergeist' Dates". Deadline Hollywood. June 20, 2014. Retrieved August 6, 2014. ^ "Poltergeist is set for 22 May 2015 and is to be released in Real D 3D". BD. June 20, 2014. Retrieved August 6, 2014. ^ Nemiroff, Perri (February 5, 2015). "First POLTERGEIST Remake Trailer: Sam Rockwell and Rosemarie DeWitt Fight a Ghost Invasion". Collider. Retrieved February 6, 2015. ^ Wickman, Forrest (February 5, 2015). "The Poltergeist Remake Looks Like No "Kids' Movie"". Slant Magazine. Retrieved February 6, 2015. ^ Hibberd, James (February 5, 2015). "'Poltergeist' reboot first trailer: 3d masking done also in India, Chennai, Pixstone Images There is a clown". Entertainment Weekly. Retrieved February 6, 2015. ^ Miska, Brad (February 5, 2015). "'Poltergeist' Trailer Looks Absolutely Bonkers!". Bloody Disgusting. Retrieved February 6, 2015. ^ Kuchera, Ben (February 6, 2015). "The first Poltergeist trailer provides the scares, but few updates to original formula". Polygon. Retrieved February 7, 2015. ^ "News: Poltergeist (2015) (US - DVD R1 / BD RA)". DVDActive. Retrieved July 21, 2015. ^ "Poltergeist". Rotten Tomatoes. Retrieved August 16, 2015. ^ "Poltergeist Reviews". Metacritic. Retrieved May 28, 2015. ^ a b Rebecca Ford, Pamela McClintock (May 23, 2015). "Box Office: 'Tomorrowland,' 'Pitch Perfect 2' in Close Memorial Day Battle". The Hollywood Reporter. (Prometheus Global Media). Retrieved May 23, 2015. ^ Andrew Barker. "'Poltergeist' Review: An Unnecessary Update of a Horror Classic - Variety". Variety. ^ Genzlinger, Neil (May 22, 2015). "Review: In 'Poltergeist,' They're Baaack, With GPS and Flat Screens" – via www.nytimes.com. ^ "'Poltergeist' is a surprisingly effective chiller: review". ^ "'Poltergeist': A splendid remake without depth of original". Philly.com. May 23, 2015. ^ "Poltergeist review: 'an efficient scare-machine'". The Telegraph. ^ "Poltergeist: Not a Travesty; Not Scary, Either -- Vulture". Vulture. ^ "Poltergeist, 2015: This House is Meh - Village Voice". ^ Cook, Linda. "'Poltergeist' remake OK, but won't stay with you". ^ Anita Busch (May 22, 2015). "'Tomorrowland' Limited Release While 'Poltergeist' Grabs Strong $1.4M – Box Office Thursday". Deadline Hollywood. (Penske Media Corporation). Retrieved May 22, 2015. ^ a b Anita Busch (May 24, 2015). "No Heat At Memorial Day B.O. : 'Tomorrowland's Rocket Runs Outta Gas With $41.7M Bow – Monday Update". Deadline Hollywood. (Penske Media Corporation). Retrieved May 25, 2015. ^ a b Nancy Tartaglione (May 26, 2015). "'Tomorrowland's $74.7M Global Bow; 'Pitch Perfect 2′ Singing $190.4M Cume; 'Mad Max' Smokin' $227.7M – Wwide B.O. Update". Deadline Hollywood. (Penske Media Corporation). Retrieved May 27, 2015. This page was last edited on 13 April 2019, at 08:28 (UTC).